In a complex world, Kairos offers an alternative. Volatility returned to markets in 2018. As equity markets have reached the final stage of the economic cycle and bond yield compression is now entrenched, we are forced to seek out alternative investments in the middle ground between stocks and bonds for risk/return optimization. The time is ripe to diversify the portfolio by focusing on asset classes that are less correlated with the performance of indexes. Kairos Multi-Strategy is a multi-asset solution that invests in global alternative funds with a partly defensive approach. It is one of the long-standing products historically offered by Kairos, a group renowned for its dynamic, non-directional management style with the aim of delivering steady returns over time, regardless of market conditions. The management team selects the best managers around the world with a distinctive competitive edge in the various asset classes and expertly combines them in light of the specific macroeconomic and financial context. Portfolio choices are the result of a solid analytical process informed by a tight network of relationships cultivated over time, with more than 2,500 meetings held per year with the top international managers for each market segment. Kairos Multi-Strategy’s strengths are its diversification hinging on the different asset classes, from classic stocks and bonds to non-directional management strategies, and the management team’s stock picking experience. Kairos Multi-Strategy is an investment solution that offers the best of both worlds: returns typical of equities and the volatility typical of bonds. 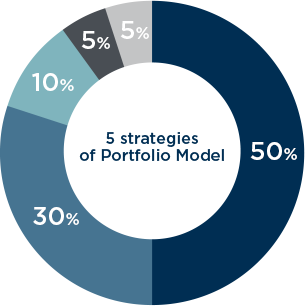 The Kairos Multi-Strategy portfolio is invested in a basket of five alternative strategies, combining tactical allocation across strategies and managers with direct analyses by the multi-manager team to amplify or dilute certain portfolio choices. The portfolio’s net exposure is adjusted to participate in rallies and minimize the impact of dips, going so far as to neutralize beta. Different market and asset class strategies are combined to exploit macroeconomic trends. Profit-taking from special situations like mergers and acquisitions, regardless of the performance of the underlying market. Volatility is treated like an asset class. Directional strategies are used to take profit from the volatility of the underlying assets embedded in derivatives. The portfolio is mainly invested in the debt instruments of unlisted companies and those listed on regulated markets. Returns are net of all administrative costs and management and performance fees and before taxes. Past performance is not a reliable indicator of future results. The value of investments is subject to decreases and increases, which may be rapid, and investors may not recover the full amount of their initial investment. Kairos Multi-Strategy’s synthetic risk and reward indicator (SRRI) is 3 out of 7, which corresponds with a medium/low risk level. The SRRI expresses the probability that the fund will incur monetary losses due to movements on the market. Kairos Multi-Strategy (the “Fund”) is an Italian open-ended alternative investment fund reserved for professional investors and the categories indicated in the Fund Regulation. Advertisement for promotional purposes only. This document does not constitute an invitation to invest. Read the prospectus before investing.